Preheat the oven to 140°C/280°F. Peel and roughly chop carrots, onion, and celery root. Clean and roughly chop leek. Place all vegetables in a roasting pan. Using a sharp knife, make incisions in the pork rind to create a diamond pattern. Salt generously, flip, and season again with salt and pepper. Sprinkle with paprika powder and caraway seeds. Rub pork with the spices and transfer into an ovenproof pot, skin-side up. Pour in half of the dark beer and transfer oven-proof pot nto the oven and let roast for approx. 5 hrs. at 140°C/280°F. Check back often to top up the pan with more dark beer, until used up, and brush the pork rind with cold water to ensure crispiness. Remove pot from the oven and transfer pork roast into a baking dish. Switch the oven to broiling function and broil for approx. 5 – 7 min. more, or until pork rind becomes crackling. Strain the roasting juices through a sieve into a pot and reduce on medium-high heat to desired consistency, then remove from heat. Transfer gravy into a gravy boat. 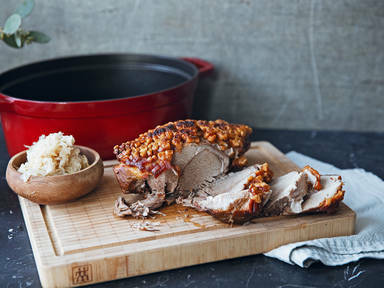 Remove pork roast from the oven and serve with sauce and sauerkraut, if desired. Enjoy!